Formerly Cougar II and Highfield Caringbah this Farr-designed Cookson NZ-built TP52 was purchased by the Fifty Two Hundred Syndicate in early 2017. Since then it has had extensive upgrades and optimization work completed, as well as adding a completely new sail wardrobe manufactured by Ian Short Sails P/L from Sydney. The boat competed as Highfield Caringbah in this year’s 2018 Noakes Sydney Gold Coast Yacht Race and finished a credible 2nd to Matt Allen’s new Ichi Ban in Division 1 IRC and 3rd overall on IRC rating. 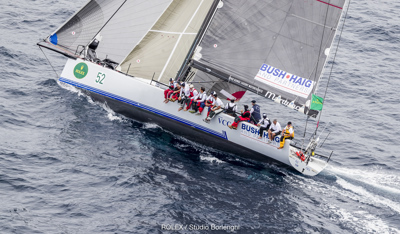 The owners and experienced offshore racing crew are looking forward to this year’s Rolex Sydney Hobart Yacht Race and hoping to improve on last year’s result.